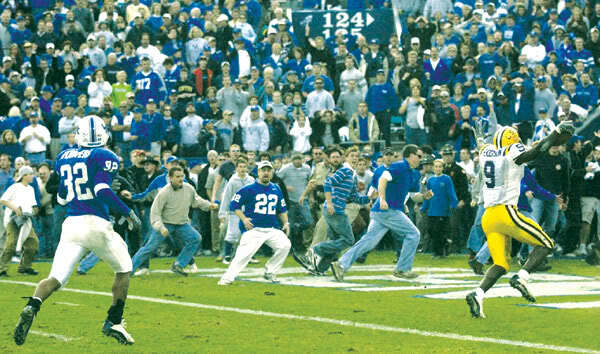 Devery Henderson (9) celebrates scoring the final touchdown of the Bluegrass Miracle game as Kentucky fans who stormed the field try to get out of the way. To help describe the Texas A&M letdown in Monday’s press conference, Alabama head coach Nick Saban referenced his time as the head man at LSU. I don’t know what to say. I feel bad for Kentucky’s players. But this is a big moment for us and I’m happy as heck for our team….Well, sometimes you gotta be a little lucky and I think that was our luck right there. How much heartbreak. Kentucky fans are up on the goal posts. I don’t know why. But it wasn’t the game that LSU was lucky to escape with that Saban was focused on, it was the game after: when Alabama came to Death Valley and handed LSU a 31-0 defeat. This time around, it was a game versus the LSU Tigers that gave Saban’s team the Bluegrass Miracle phenomenon. Watch other hits from Saban’s press conference earlier today by clicking here, plus my story the third down struggles for the Tide, including Saban’s thoughts, by clicking here. Finally, be sure to follow me on Twitter to get up-to-the-second updates on everything Crimson Tide: @Brett_Hudson. In 2010, Eddie Lacy was a student in more ways than one. Outside of being the student-athlete as labeled by the NCAA, he was also being taught by Mark Ingram and Trent Richardson the valuable lesson of ball control. Mark Ingram (22) and Trent Richardson mentored Eddie Lacy to be a dependable ball-carrier, and now he is trying to do the same with T.J. Yeldon. 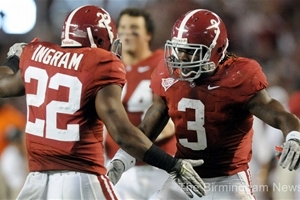 Lacy lost two fumbles in the 2010 campaign, both within the 5-yard-line as he was entering the endzone. Although Lacy’s new student was not on the brink of the endzone, true freshman T.J. Yeldon has had two fumbles in the last two weeks, one nearly costly and the other very costly. Yeldon let the ball slip out of his hands on the LSU 10-yard-line with 1:06 left, which LSU recovered and eventually scored on. Yeldon did it again with 9:10 left in the Texas A&M as the ball fell into the hands of Dustin Harris. The Aggies, like the Tigers the week before, also scored a touchdown on the ensuing possession. Lacy is trying to mold Yeldon just like Ingram and Richardson molded him and not let the fumbles derail a successful freshman season.